"I have used CSE HTML Validator Lite for years now, I love it. I've recommended it to several people. Thanks for a great product!" "I was used to a free online tool, which is nowhere near as simple to use as CSE HTML Validator Lite. It suits all my needs as a web developer and I have recommended it to many colleagues already!" "CSE HTML Validator Lite is a superb application -- does everything I hoped and much more." NOTE: CSE HTML Validator Lite has been discontinued (no more updates are planned) but the last release is still available (for now). An upgrade to the standard or pro edition, which still gets frequent updates, is highly recommended. CSE HTML Validator Lite is a free HTML editor and basic HTML (including HTML5), XHTML, and CSS (including CSS3) syntax checker for Windows XP/7/8/8.1 and Windows 10. It's basically a reduced functionality older version of CSS HTML Validator Standard, but it's free (even for commercial use) and is still useful. "There aren't many freeware programs out there these days that are this well done and useful." "I downloaded CSE HTML Validator Lite about two months ago and have used it ever since. It's absolutely delightful to use - and has options for everything you can think of (and a lot that you can't!). But in spite of the options, it can be used by amateurs like myself with the default values only. I have tried several other validators before and none comes near it for ease of use, flexibility, and thorough reliability. When I develop to the stage of needing the even more powerful edition, I won't bother to look elsewhere, as I'm confident this product will be of the highest standard also. Well done, and thanks." 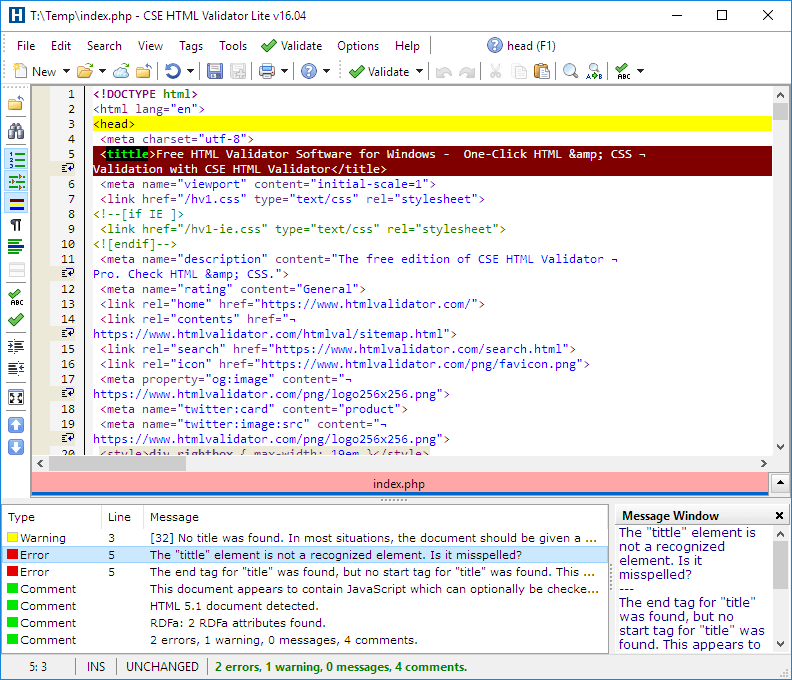 CSE HTML Validator Lite v16.05 includes updated HTML5 support, CSS checking (including CSS3), and a built-in HTML/XHTML/text editor with dynamic help, syntax highlighting, split view, and spell checking. After downloading, simply run the downloaded file to install CSE HTML Validator Lite. CSE HTML Validator Lite screen shot showing the validation results at the bottom.